A Russian babushka has finally met her idol Charles Aznavour at the concert in Moscow. She became known after a viral Facebook campaign calling on the public to secure her a ticket. But the singer himself, moved by her story, wanted to meet his fan. “Bonjour, Monsieur Charles Aznavour,” excited Lydia told the chanson legend after Aznavour performance. To impress the star, she sang an excerpt from ‘The Toy’ by Pierre Richard. She gave him flowers and thanked him for the concert. The French singer presented a big bouquet of roses to the pensioner. At the concert the Russian had a spot right in front her idol. There were many people in the hall who recognized Lydia from the Facebook post and asked for a photo with her. “These songs give him [Aznavour] vitality,” Lydia told Komsomolskaya Pravda at the concert, adding that she mostly admired his ‘Ave Maria’ and ‘Les Deux Guitars’. The story of 73-year-old Lydia Ivanovna started back in March this year when she met journalist Aleksandr Chernykh in the subway. The elderly woman was standing at a newspaper vending machine looking at a magazine with the photo of the French-Armenian tenor Charles Aznavour. 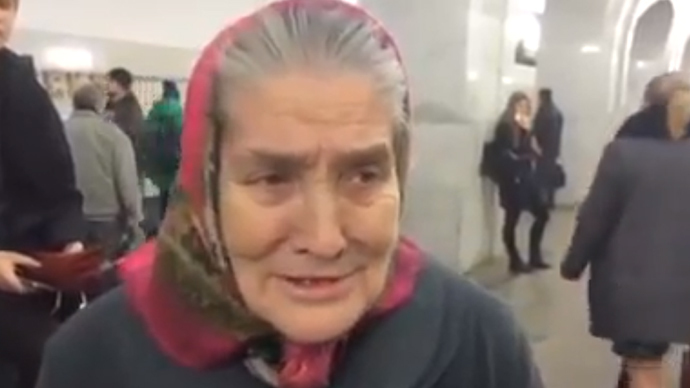 The babushka was referring to the event at Moscow's Crocus City Hall on April 22, with tickets costing up to $600 (30984 rubles) - quite a big sum for a pensioner. Lydia turned out to be a fan of French singers since early childhood. She loves to sing along with them, and proved it by singing a few songs. Chernykh’s Facebook post motivated the public to secure an Aznavour concert ticket for the fan. Aznavour, 90, was moved by the story and wanted to meet his Russian admirer at his concert in Moscow. At first Lydia Ivanovna was surprised about the invitation and refused to go but then changed her mind – apparently her affection for the singer prevailed. Когда вчера вечером ребята из Barev.Today разговаривали в Москве с бабушкой Лидой, Шарль Азнавур в Париже еще не знал, ч...Posted by Александр Черных on 19 Март 2015 г. “This is an extraordinary story,” Aznavour, who has written over 1,200 songs and sold more than 180 million records, said in a Facebook video. “This is a problem of the cost of tickets at the concerts. I decided to lower the cost [of tickets] in future because there are many people who can’t come,” added the singer, who is of Armenian descent and has taken part in social activism and politics in both France and Armenia.